It’s often said that breakfast is the most important meal of the day. It’s also a great time for experimenting in the kitchen and trying new recipes. On a recent trip to Liverpool we stopped in at Greggs bakers for a quick pastie and noticed a breakfast slice on the menu. As there are no Greggs in Northern Ireland we always make sure to visit it on our travels to the mainland. While it’s not 5 star dining, it certainly is tasty and the breakfast slice did not disappoint. It also got us thinking, so we decided on our return home to try and make our own version of the Greggs breakfast slice. We were really happy with the result so thought we’d share it with you. Start by dividing the puff pastry sheets into quarters with a sharp knife. Brush the egg yolk around the edge of each rectangle of pastry. Your pastry is now ready. Next thing to do is start on the filling. Cut the sausages into small pieces and fry off until golden and cooked through. Pour your baked beans into a small container, removing some of the excess tomato sauce. Once you have done this you are ready to fill the pastry. Before you start to fill the mix, preheat your oven to 200ºC (180º for fan assisted oven). 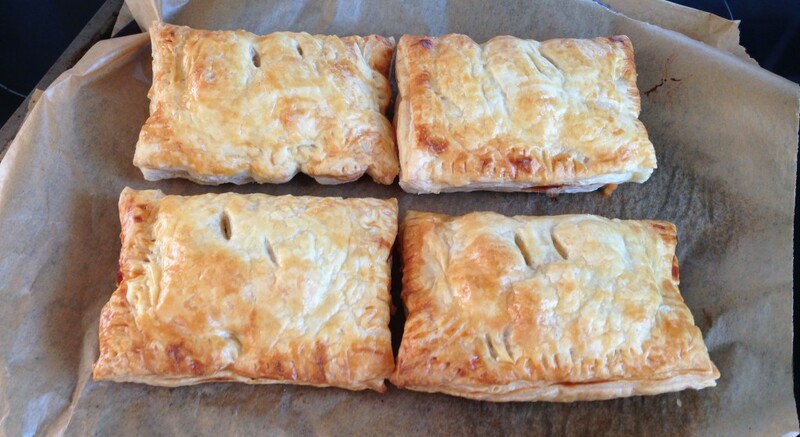 Fill each slice of pastry individually, starting with the addition of the chopped sausage. To this, add a spoonful of bean and a small helping of the grated cheese. These will both cook when the pastry is in the oven. Season with salt and pepper. Ensure the filling covers half the pastry slice, and taking the other half, fold it over ensuring you press down the sides. It is important to ensure there are no gaps in the pastry and wash the sides down with the egg yolk. Slice some holes in the top of the pastry to let steam out during the cooking process and glaze the top with the egg yolk to ensure a golden brown finish. Once you have all the pastries filled, put them on a baking tray and put into the oven. Add a sheet of grease proof paper to the baking tray to ensure the pastries don’t stick. Cook the pastries for 15 – 20 minutes until golden brown and remove from oven. The sausages will already be cooked so this stage ensures the pastry is cooked with a golden crust finish. 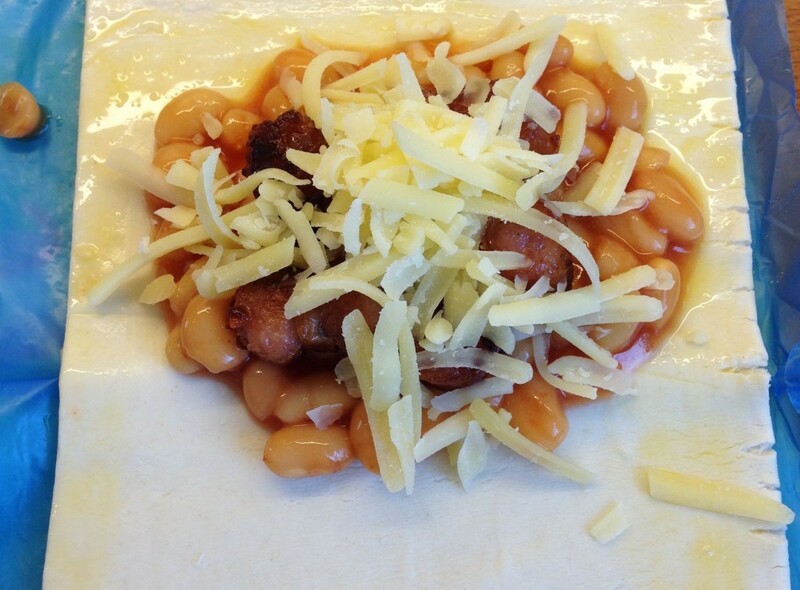 The beans will be cooked and the cheese will be melted and gooey. Now all that remains for you to do is dish up the pastry and serve for a breakfast treat with a difference. Here is a quick Vine video which gives you a short guide to making the breakfast slice. Share your own breakfast recipes with us by commenting below or connecting with us on Facebook and Twitter.